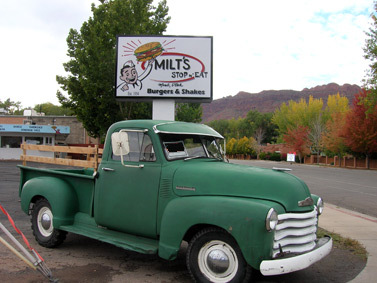 Milt’s is Moab’s oldest restaurant. It was first opened in September of 1954, by Milt Galbraith. Much of Milt’s remains the same as it did in 1954. 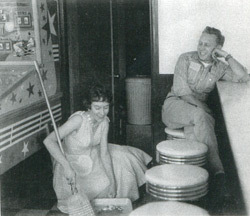 The vinyl-topped stools and the patterned Formica counter which overlooks the open grill and kitchen are all original. Milt’s is still known for its delicious burgers, homemade fries, and refreshing malts. 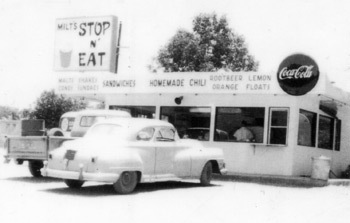 Milt’s was originally on Main Street. 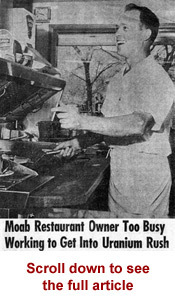 But now Milt’s is still located in the same spot and Moab’s Main Street has moved. Milt and his wife Audrey ran Milt’s for 24 years. They used to live in a trailer located in the spot which is now the outside patio area and Sycamore tree. Milt and Audrey are in their 80’s now and live up the street. They like to play golf, take walks, and still periodically visit Milt’s. 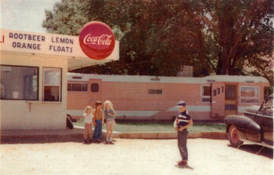 John and Sonja Sensenbrenner bought Milt’s in 1978. They ran Milt’s for 26 years. John is known for measuring the portions to the exact size to keep prices low. He would even tear a fry in half to make certain the portion size was exact! John and Sonja also periodically visit Milt’s. There was a third owner by the name of Becky, who ran Milt’s for about 9 months. She sold Milt’s to Rex Tanner. Rex, along with his wife Penny, daughter Asia, and son in law Daniel ran it for 2 years. In July of 2007 Milt’s was purchased by the current owners; Danelle Ballengee and BC Laprade. BC and Nellie want to keep the Milt’s tradition and history alive by maintaining the same standards of quality food and quality service since 1954. Milt’s is a locals favorite because of its quality food, friendly service, and reasonable prices. Locals and tourists alike return to Milt’s, sometimes on a daily basis! The Chili Cheeseburger has been the most popular menu item over the years. The food at Milt’s is not ‘fast food’; the ingredients are fresh and prepared to order. Milt’s uses locally raised Hormone-Free Grass-Fed Beef. Patties are hand crafted daily. The fries are made from fresh, whole Russet potatoes; cooked in healthy Peanut Oil. We use vegetables grown on local farms as much of the year as possible. Milts serves Natural Chicken Breasts. Our Old-Fashioned Shakes and Malts are made with fresh milk (from happy Swiss Brown Cows) at the McClish Family Dairy; located in Moab’s Spanish Valley. and being a part of history!